I love taking pictures! I am almost always thinking "oh that would be a great picture". I also have two young children who have a hard time sitting still and are always on the move. This has resulted in some blurred pictures for sure. I have been looking for a great sports camera something with a flash that is quick to get back up and running and also something that can take great action photos. I was also looking for something for a reasonable price. 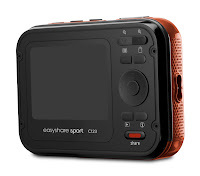 Let me introduce you to the new Kodak EASYSHARE Sport. This camera sells for $79.95 Canadian on the Kodak website. This camera has some really nice features. It is a 12 Megapixel with a 6.1cm LCD. The zoom is 5X advanced digital. Big feature for the Sport, it is Waterproof up to 10 Feet! It is also Dust proof. Life happens especially with children and its great to know that your camera won't be ruined if it gets wet. Also with the waterproof feature there is the option to take stills or video. It also white balances underwater! We are a very active family when summer time comes. We spend most of the time at the park, beach, or at the soccer field. I am almost afraid to bring a camera with me to the beach because of the sand and water. With EASYSHARE Sport I can take all those fun summer time photos without worrying and I can get some fun underwater shots also. Another great feature is the EASYSHARE Share button. This is the only camera with a 3-step sharing button. This button is so easy to use and will help with sharing your photos with your family and friends online on pretty much any social site you use, Twitter, Facebook, email etc. My children right before we left on vacation! For the cons, I do find it can be grainy, mostly when trying to zoom in really close. I love to have a good zoom and this one didn't cut it for some wildlife I was trying to take pictures of. I did get the picture but it could have been better. In the end? I say this is one great Sporty camera. The flash also boots back up really fast after the first picture is taken which for me was one thing I didn't like about my other camera.We were unable to give it a great test underwater but play to as soon as the weather allows us to. This past weekend was chilly but I was able to try it out a little. I got a few photos taken underwater. I pulled the camera out of the water and the water just beaded off the camera. The memory card and batteries safe and sound. Just make sure to wipe away any remaining water from the lens after or you will end up with water makes on the next photo. 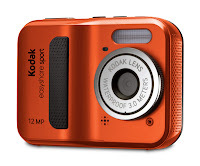 Where to Buy: Kodak Website, Also download great software on their site along with an iPhone or Blackberry app!